AutoCAD 2015 includes a new feature called Application Manager. I’m sure it serves a lofty purpose, but it comes across a lot like the slimy Norton and Adobe updaters that are really just Trojans in disguise. It gets installed by default, with no option to prevent installation. To Autodesk’s credit, they do provide instructions for preventing installation of Application Manager, and instructions for removing it after the fact. Uninstalling requires several additional clicks, as if they really, really want you to think twice before taking such a drastic measure. I don’t want anything starting when I log into Windows except the bare minimum, so I uninstalled Application Manager forthwith. It can be installed and started manually if I decide to use it later. 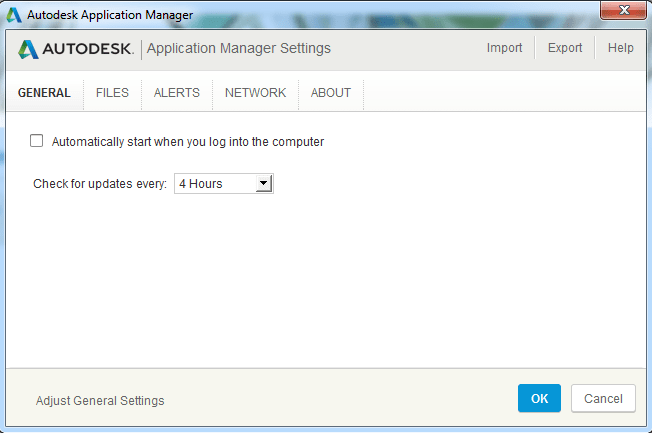 If you decide to use Application Manager, there are some configurable settings. There is even a UI for most of the settings (such as disabling the automatic startup), but there’s a catch: to use the UI for changing settings, you first have to agree to the Autodesk Privacy Statement (and give Autodesk access to information about your installed software). I’m sure this is just an oversight, but the paranoid will not find it comforting. It’s not too often that lawyers give away their work, but Gene Quinn of IPWatchdog.com is doing just that by providing some free sample confidentiality agreements. If you can afford to pay an attorney for simple agreements like this, more power to you; otherwise you may want to grab these free agreements while you can. There is of course a disclaimer, but thankfully it’s short and simple just like the agreements. For AutoCAD 2011, Autodesk made relatively few changes in the EULA. They fixed the grammar error that was introduced in AutoCAD 2010, but they didn’t make any changes to the convoluted “License Grant” wording that was also added in AutoCAD 2010. In the context of any bankruptcy proceeding, You acknowledge and agree that this Agreement is and shall be treated as an executory contract of the type described by Section 365(c)(1) of Title 11 of the United States Code and may not be assigned without Autodesk’s prior written consent, which may be withheld in Autodesk’s sole and absolute discretion. Just for fun, I made a chart that shows how the AutoCAD US/Canada EULA has grown since AutoCAD 2000. The EULA grew 150% from 12139 non-space characters in AutoCAD 2000 to 30235 non-space characters in AutoCAD 2011. For what it’s worth, the size of acad.exe grew 75% in the same timeframe. Tyler Ochoa (law professor and two time “Jeopardy!” champion) writes an interesting post about the 300th anniversary of the first copyright law, called the Statute of Anne. Referring to the motivation behind the original law, Ochoa says “Although the Stationers were chiefly concerned with restoring and perpetuating their monopoly, they framed their petition to Parliament in terms of justice for authors.” In many respects, not much has changed since 1710. Everyone else is discussing all the cool new features in AutoCAD 2010, so I decided to have a look at what’s new in the EULA (End User License Agreement). I compared the AutoCAD 2010 EULA for US/Canada to the AutoCAD 2009 EULA. I won’t divulge the process I used to automate the comparison, because the odds are pretty good that I violated the EULA somewhere along the way, and I want plausible deniability. The first change I noticed is that the AutoCAD 2010 EULA contains more shouting. The 2009 EULA started out in a fairly mellow mixed case with a few shouts thrown in for effect, but the 2010 EULA dispenses with the lower case and launches right into a multi-paragraph avalanche of screaming block letters. Apparently nobody was listening, so they turned up the volume. SOFTWARE OBTAINED FROM THIRD PARTIES THAT HAVE NOT BEEN AUTHORIZED OR ALLOWED BY AUTODESK, DIRECTLY OR INDIRECTLY, TO SUPPLY SOFTWARE IS LIKELY TO HAVE BEEN MADE AVAILABLE IN VIOLATION OF AUTODESK’S RIGHTS. IN SUCH AN EVENT, AUTODESK IS NOT OBLIGATED TO ISSUE AN ACTIVATION CODE OR OTHERWISE PERMIT YOU TO INSTALL OR USE THE SOFTWARE. Next time you’re eyeing that used copy of AutoCAD 2010 on eBay, be warned that Autodesk is not obligated to permit you to install or use the software. They don’t come right out and say that they won’t allow it, so maybe they won’t mind — but then what’s the point of including this clause? Tim Vernor won’t be very happy about this change. Moving along, I see that they added a definition for “Uninstall”, defining it as “to destroy or remove”. The definition of “User Documentation” was very slightly changed from “…after You acquire or Install the Software…” to “…when or after You acquire or Install the Software…”. Incidentally, did you know that Autodesk considers an AutoCAD reseller’s invoice to be “user documentation”? Rounding out changes in definitions is a change in the definition of “You”. Yes, Autodesk has redefined “You” whether “you” like it or not. I could go on and on about small wording changes, and while it would be interesting to contemplate why each change was made (and how many scheming lawyers it took to do it), we’d risk missing the forest for the trees. You may Access the application programming interfaces that may be included with or in the Software or otherwise available from Autodesk for use with the Software (“API’s”) to develop programs, modules, components or functionality that (i) are compatible with and are used and/or interfaced with the Software and (ii) contribute significant value-added functionality or enhancements to the Software (“API Modules”) provided You may Install and Access such API Modules solely on Computers where a licensed copy of the Software is also installed and further provided such Installation and Access is solely in connection with Your Installation and Access of the Software and solely for Your internal business needs. You may not redistribute all or any portion of an API Module. Read that again. That’s right, you may not write any “programs, modules, components, or functionality” unless they “contribute significant value-added functionality or enhancements” to AutoCAD. Furthermore, if you do manage to write a program that adds significant functionality, you may not redistribute all or any part of it. What are those guys smoking out there in California? Finally at the end of section 2.1, they changed “No license is granted under the terms of this Agreement if You did not lawfully acquire the Software” to “No license is granted under the terms of this Agreement if You did not lawfully acquire the Software from Autodesk or from a third party who has been permitted or authorized by Autodesk either directly or indirectly to supply the Software”. Take that Tim Vernor! In another nod to the Vernor case, section 2.3, “Upgrades”, adds a new requirement to “destroy all Autodesk Materials relating to the Previous Version or, upon request by Autodesk, return all such Autodesk Materials relating to the Previous Version to Autodesk or the company from which they were acquired”. This is important language that could persuade a court to view an AutoCAD purchase as a license instead of a sale, thereby giving Autodesk the power to control the secondary market. Interestingly, section 2.4, “Crossgrades”, requires that the previous software be uninstalled within 60 days, but has no requirement that it be destroyed. However, new language in section 2.7, “Termination”, which requires the software to be destroyed “upon termination of the license grant or this Agreement”, apparently covers both cases. A funny change in section 3.2.3, “Transfers”, appears to close a loophole. The AutoCAD 2009 EULA disallowed transfers to “any other person”; the AutoCAD 2010 EULA disallows transfers to “any other person or legal entity”. Considering a license transfer? Make sure it’s to an illegal entity! Finally, the infamous “audit clause” has been revised. Not the way you may have hoped, I’m sad to report. Luckily the change was a minor one that doesn’t make the clause any more overbearing than it already was.